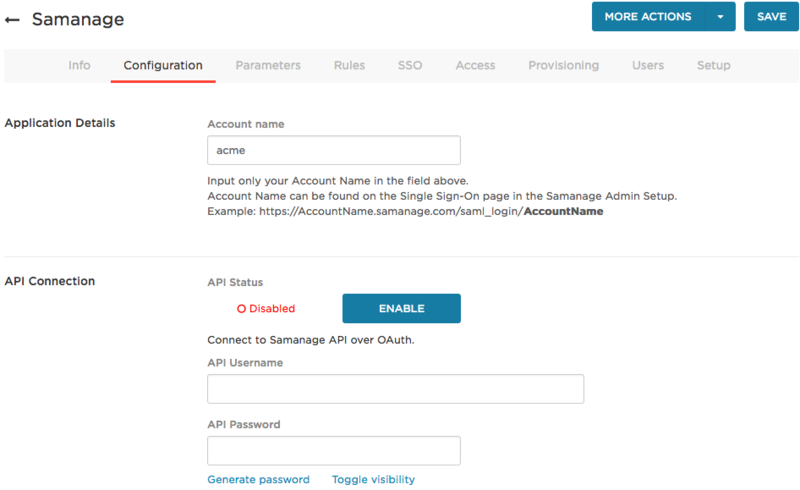 This article describes how to configure OneLogin to provision users to Samanage. Important! If your Samanage account already includes users, you must synchronize user logins between OneLogin and Samanage before you provision users to Samanage. This step is required to match OneLogin users with existing Samanage users, and is described below. We mention it here because it is an unusual requirement, and we don't want you to miss it! Ensure that existing users' email addresses in Samanage are all lowercase. Read Introduction to User Provisioning if you want an overview. Go to Apps > Company Apps and select your Samanage app. Go to the Configuration tab and enter your Samanage admin credentials in the API Username and API Password fields. Note that the Account name should already have been entered when you configured SAML SSO for Samanage. Click the Enable button to connect to the Samanage API. A green Connected status and the conversion of the Enable button to Disable indicate a successful connection. You can click Disable if you want to disconnect and reauthenticate to the Samanage API. Select Enable provisioning for Samanage. For any action you select, a OneLogin administrator must go to Users > Provisioning and manually approve each action for provisioning to complete. Clear these options if you want OneLogin to provision new users and user updates to Samanage without administrative approval. Important! If your Samanage account already contains users, you MUST set these options to require administrator approval. Because of the unusual way that the Samanage API works, you must hold users for approval before provisioning so that you can synchronize logins between OneLogin and Samanage user accounts before letting the provisioning event proceed. You will synchronize logins in a later step. Even if your Samanage account has no users, we still recommend that you enable these approval options when you set up provisioning for the first time, so that you can confirm that the correct users are being provisioned with the correct entitlements. Once you have confirmed that provisioning is working as expected, you can clear these options to enable provisioning to proceed without approval. Select what happens to a user in Samanage when that user is deleted from OneLogin. (Optional) Click Refresh to pull your Samanage Department, Site, or Role values into OneLogin, so that they are available to assign to users when you provision them to Samanage. For more information about assigning users to these Samanage entitlements, see Using Rules to provision users with Samanage entitlements. In this task, you'll map Samanage user attributes to OneLogin user attributes. These mappings tell OneLogin how to populate user attribute values to Samanage when provisioning users from OneLogin. If you have a OneLogin attribute value that you want to send over to populate a Samanage field, you'll define it in this task. Map attributes to OneLogin attributes. For each field that you want to include in user provisioning, click the parameter row to open the Edit Fieldname dialog, where you can change the default, if necessary, and select the Include in User Provisioning option. Parameter-specific details are listed in the table below. Use the Department parameter to provision a user as a member of a Samanage department. You must set up Departments in Samanage and select from among those departments in OneLogin. To have your existing Samanage departments display as available values when you configure provisioning, you must first refresh entitlements. To do this go to the Provisioning tab and click Refresh. To provision all of your users to the same Samanage department, click the Department row on the Parameters tab, and select the department from the drop-down on the Edit Field Department page. If you want to provision a subset of your users to a Samanage department, configure provisioning using Rules. See Using Rules to provision users with Samanage entitlements. If you want to assign Samanage departments to users one-by-one, leave Value set to - No value -. Click the Department row to display the Edit Field Department dialog, and set Default if no value selected to - No default -. Now you can select the Department value directly from the user login record by going to the Users tab and clicking the username. Mobile Phone - No default - Provisioning Use this parameter to provision a user's mobile phone number to their Samanage user account. To use this parameter, you must first set up a custom user field in OneLogin to hold the mobile phone number. Phone Phone Provisioning Use this parameter to provision a user's primary phone number to their Samanage user account. By default, you map this parameter to the standard OneLogin Phone field. Use the Role parameter to provision a user with an assigned Samanage role. You must set up Roles in Samanage and select from among those roles in OneLogin. To have your existing Samanage roles display as available values when you configure provisioning, you must first refresh entitlements. To do this go to the Provisioning tab and click Refresh. To provision all of your users to the same Samanage role, click the Role row on the Parameters tab, and select the role from the drop-down on the Edit Field Role page. If you want to provision a subset of your users to a Samanage role, configure provisioning using Rules. You can also use Rules to override the setting you make on the Parameters tab. For example, you can set all users to the Portal User role on the Parameters tab, and then use Rules to assign a subset of users to administrative roles. See Using Rules to provision users with Samanage entitlements. If you want to assign users to Samanage roles one-by-one, leave Value set to - No value -. Now you can select the Role value directly from the user login record by going to the Users tab and clicking the username. 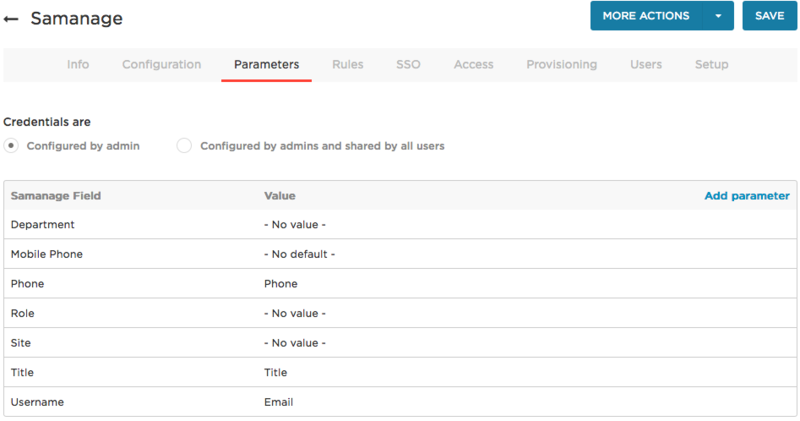 Use the Site parameter to provision a user with an assigned Samanage site. You must set up Sites in Samanage and select from among those sites in OneLogin. To have your existing Samanage sites display as available values when you configure provisioning, you must first refresh entitlements. To do this go to the Provisioning tab and click Refresh. To provision all of your users to the same Samanage site, click the Site row on the Parameters tab, and select the site from the drop-down on the Edit Field Site page. If you want to provision a subset of your users to a Samanage site, configure provisioning using Rules. You can also use Rules to override the setting you make on the Parameters tab. For example, you can set all users to the HQ site on the Parameters tab, and then use Rules to assign a subset of users to other sites. See Using Rules to provision users with Samanage entitlements. If you want to assign users to Samanage sites one-by-one, leave Value set to - No value -. Now you can select the Site value directly from the user login record by going to the Users tab and clicking the username. Title - No default - Provisioning You can set this to the OneLogin Title field to include the user's title when you provision them as a Samanage user. This should remain set to Email. If your Samanage account already includes users, you must synchronize user logins between OneLogin and Samanage before you provision users to Samanage. This step is required to match OneLogin users with existing Samanage users. If you have no existing Samanage users, you can skip this step. Go to the More Actions menu and click Sync logins. OneLogin will retrieve the list of users currently in Samanage and automatically link those users to the OneLogin users assigned to the app based on the email address. Important! The behavior of the Samanage API requires that email addresses for all of your existing Samanage users must be lowercase in Samanage for the Sync logins process to work! There may be users accounts in Samanage that OneLogin can't sync to OneLogin users because they use different usernames. You can find and fix these unmatched users by going to the Users tab and clicking the Unmatched Users button. For more information, see Matching Users. There are three entitlements that you can assign to OneLogin users when you provision them to Samanage: Department, Role, and Site. You create the values for these entitlements in Samanage, and pull them into OneLogin by clicking Refresh on the Provisioning tab for your Samanage app. They then become available for selection when you create Rules to assign entitlements to users. Go to the Rules tab and click the New Rule button. On the New Mapping dialog, enter the Conditions that trigger the entitlement assignment and the Actions that assign the entitlements. 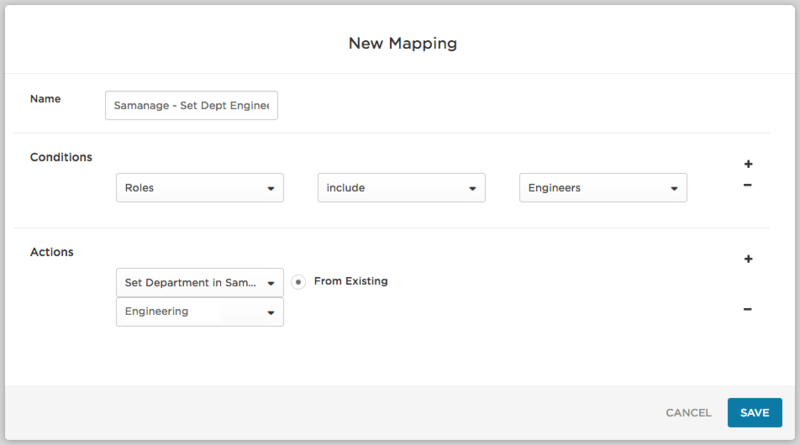 For example, you can create a mapping that assigns all users with the OneLogin role "Engineers" to the Samanage Department "Engineering." You set the Conditions to Roles > include > Engineers and the Actions to Set Department > Engineering. (Optional) On the Rules tab, click the new rule to reopen the Mapping dialog, where you can check that the rule applies to the correct users. Start typing, and any matching users will appear in the drop-down list. Select a user to check that the rule applies to them. You can select as many users as you want before you click Check. Each user will be listed as Will be mapped or Will not be mapped. Click Save when you're done checking. Click the More Actions button and select Reapply Provisioning Mappings from the drop-down menu. This will re-apply all rule mappings to your users. Important! You must reapply mappings every time you create or update a rule or mapping! Confirm that provisioning for Samanage is configured to require admin approval. Add a test user to OneLogin. Give that user access to Samanage. Go to Users > Provisioning and check your test user's provisioning status. If the provisioning status is Pending, click the Samanage row to approve the provisioning event. The provisioning row should now display as Provisioned. If it displays as Failed, click the row to view the reason for the failure and to retry the provisioning event. When the user is marked as Provisioned in OneLogin, go to Samanage and confirm that the new user has been added with the correct attributes.